My morning training sessions run four to five hours now that it’s race season. After sweating and concentrating from sunrise to lunchtime, I crave fat, salt, carbs—and a salad. Yet, I rarely have the patience to chew dainty bites of lettuce. A far more palatable prospect is to layer vegetables on hefty bread and pile on the protein. 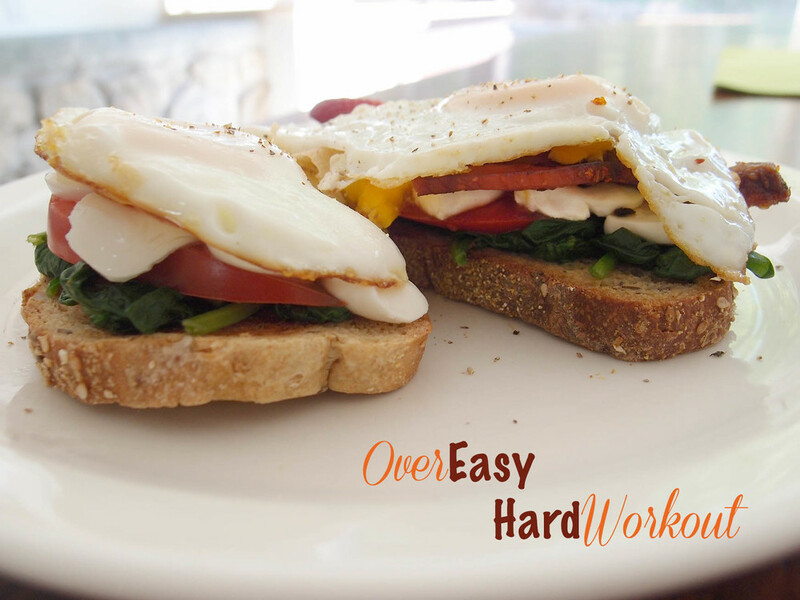 My current favorite post-workout sandwich starts with a fried egg and thick slices of fresh mozzarella. Sautéed spinach and sliced tomatoes stand in for the “salad” part of the meal. A fried egg works best for this sandwich, since it keeps the bread dry. Beyond that the variations are many. Replace the spinach with peppery raw arugula. Ditch the mozzarella to lighten the dish. Swap in barrata for the mozzarella to make this sandwich even more luxurious. Or, to make it dinner-worthy, add a thick slice of bacon. I’ve made this on a Ciabatta roll and on a soft seeded roll, and both hold the ingredients together well. Whole-grain toast upped the fiber content but buckled, turning it into an open-faced meal. The latter required a fork and knife. But there was nothing dainty about it. Line a plate with two paper towels. Heat a medium frying pan over medium-high heat for 1 minute. Add 1/2 teaspoon of the olive oil, the spinach, and a pinch of sea salt. Cook until the spinach wilts, 1 to 2 minutes. Transfer to the paper-towel lined plate. Discard any remaining liquid from the pan. Toast the bread while you fry the eggs. Set the pan you used for the spinach over medium-high and add the remaining 2 teaspoons of olive oil. Slide the eggs into the pan, sprinkle with a pinch of sea salt and a grind of fresh black pepper. Cook for 1 minute, then cover the pan and cook until the whites are set, 1 to 3 minutes. If the eggs stick to the pan, gently nudge a metal spatula underneath them. 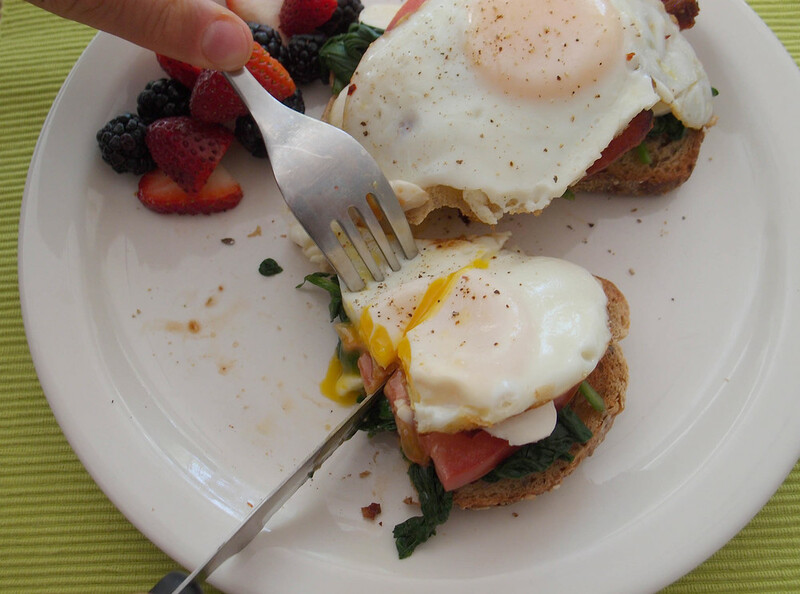 Layer half the spinach, sliced tomatoes, mozzarella, and one fried egg on each piece of toast. Drizzle with spicy ketchup or hot sauce. Eat immediately.